Greece immigration crisis: Why would someone want to live in Greece during its economic crisis? A lot of people. And the country has never been less equipped to absorb them. 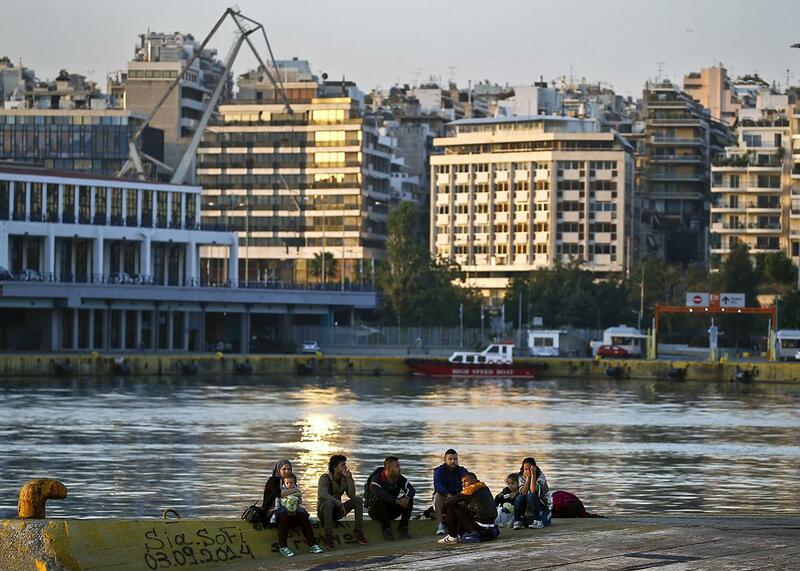 Syrian refugees rest after arriving in Greece on June 14, 2015. ATHENS, Greece—Images of disgruntled Greek pensioners waiting to get cash from ATMs have become a miniature genre of photojournalism in recent months, a shorthand for the individual pains caused by their country’s debt crisis. Just as Greece has struggled to pay its bloated bills to pensioners and the rest of Europe, however, a massive influx of immigrants from North Africa and the Middle East is straining Greece’s already diminished capacity to process and accommodate refugees from war-torn countries. While Greek banks have reopened and contentious bailout negotiations are gradually progressing, new austerity measures could leave the government with even less money to spend on services for Greeks, let alone on assistance for immigrants. These migrations, part of a broader influx into Europe, have created their own species of somber imagery—young men from Syria sleeping by suitcases in the corners of cafés, burqa-clad women sitting on sidewalks in the July heat, whole families sharing a single Coke at a restaurant for the better part of an afternoon. It’s impossible to walk through certain neighborhoods of Athens without noticing hundreds of immigrants, many of whom have arrived only in the last few weeks with little money, papers that allow only a temporary stay in Greece, and no easy way to travel anywhere else. The Greek state lacks the resources to feed and shelter these immigrants, but it also lacks the ability to prevent them from entering the country, which they do primarily via islands off the Turkish coast and through northern Greece’s border with Turkey. Greece has had a reputation for lenient immigration enforcement for years, but its financial crisis threatens to worsen a spike in undocumented immigrants precisely when the country is least able to absorb them. A member of the Greek Coast Guard stationed at the island of Lesbos told the Greek newspaper Protothema on July 8 that 500 immigrants were arriving there each day. The paper also reported that a riot broke out on Lesbos this month when some of the 4,000 immigrants currently on the island learned that the distribution of free meals for immigrantion would cease because the Greek government had not paid the company supplying the food in several months. Businesses complained that the disturbances and overcrowding were leading to tourist cancellations during peak season. On one especially frantic day in mid-July, 1,700 people arrived on Lesbos, according to the Greek Council for Refugees. The Greek military news website OnAlert reported that 28,260 immigrants landed on Greek islands between June 23 and July 12. Lesbos is only one of many islands facing similar problems. One afternoon this month in Athens, three young men in their mid-20s from Aleppo, Syria, had just arrived in Athens after spending the previous three days camping on a beach on the island of Mytilene. They were seated near a group of roughly 100 immigrants from Syria, Iraq, and Afghanistan, outside a café with Arabic signage in a dingy corridor just off Omonoia Square, a 10-minute walk from the Greek Parliament. The three left Aleppo in mid-June, a few weeks after graduating from the university, and traveled from Syria to Lebanon to Turkey. Two had completed degrees° in engineering; the third hadis just finished dental school. They said that in Aleppo there was no clean running water, no electricity, constant danger from bombs and stray bullets, and no possibility of work outside of joining the Assad Army or a rebel militia. From Ismir they made a six-hour journey north in a crowded van to Dikili, where they boarded a small raft. The raft was meant to hold no more than 15 people, but they sailed in a group of nearly 50, including many small children. The raft’s engine was weak and old. “We are very lucky; we could very easily die,” one told me. Their first attempt to cross to the Greek island of Mytilene failed after a Turkish police boat crashed into their raft, causing a small explosion. They made it across to Mytilene on the second try. Once they reached the island, they pitched a tent on a beach and set one person on guard duty whenever the other two slept. “There is little food, and people were fighting to get it,” one said. “Also, there are lots of thieves around.” The found the Greek customs officials who signed the temporary papers that let them travel to Athens abrupt and disdainful, but they were feeling positive about the country. “People are generous here, they let you stay in the streets without putting you in prison, and food is very cheap,” one said. The day before they sailed, they read on Facebook that approximately 30 Syrians had drowned after their boat sank off the coast of northern Turkey. The three all owned smartphones, which they used to check Facebook pages that collect tips for Syrians sneaking into Europe. The advice on these pages covers everything from how much to pay a smuggler for a sea crossing—$1,000 is a good price—to how to avoid the Hungarian police, who are rumored to break fingers of detained immigrants. They heard such stories of cruelty from friends of friends and read warnings on Facebook. While it’s hard to know how much embellishment creeps into secondhand anecdotes, both American and European media have reported on inhumane treatment by Hungarian immigration authorities, including mandatory strip searches and long waits in freezing temperatures. After two days in Athens, the men were planning to move north to Macedonia, then pass through Serbia, Hungary, and Austria with the goal of eventually reaching Germany. In Hungary, “We will have to go at night, and take secret paths through the forest,” one said. They were hesitant to reveal their names or give the specifics of their route.